Here’s my version of the 1997 Joy of Cooking recipe for an Asian chicken salad. It’s super easy, since the meat is braised, not fried. It’s great as a left-over, too, and hardly heats up the kitchen. Chicken salad probably seems like a misnomer, but it truly is accurate! Bring this concoction to boil, then drop to a simmer for 5 minutes to a half hour (I think longer is better) while you prepare poultry to your preferences. I usually use boneless, skinless turkey thigh, well cleaned of excess fat and tissue (ick), then briefly rinsed. I suspect most people use chicken pieces, but you could also use Rock Cornish hens, or a more exotic species. Add the meat, bring back to a boil, then turn down the heat immediately so it just barely simmers, with the cover on. Cook until done, 20 minutes, or more, depending on the size of the chunks. Turn the heat off and leave the cover on, and let the pot sit there. Have a cocktail while you prepare the greens. 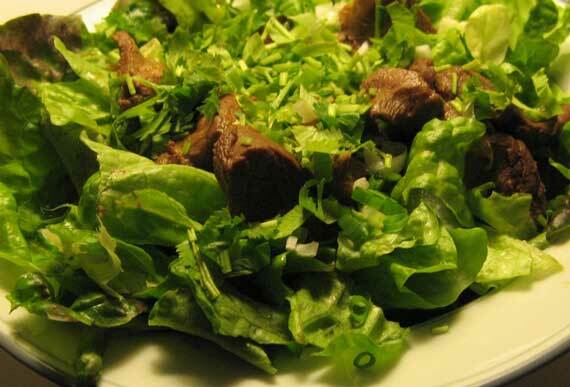 On individual plates (I use broad, shallow bowls), pile clean lettuce, torn into bite-size bits, to make a bed for the meat. Slice up some green onions and fresh cilantro leaves. In the final assembly, spoon a portion of meat chunks over the greens, along with a generous amount of the warm braising liquid (this is the “dressing”). Sprinkle a few drops of toasted sesame oil on the meat chunks—perhaps 1/4 teaspoon total per serving. Top with sprinkles of green onion and cilantro. The latter is really a terrific touch. * Beware if you use an American brand; the braise may be too salty. My current favorite is Trader Joe’s low sodium soy sauce….